Submissions for our How I Took It contest are starting to roll in and today I would like to share an interesting submission that has to do with blue moons astronauts and, of course, photography. Photographer Jason Carlton made a basic tutorial about shooting the moon. You’d be surprised at how little gear you need to photograph spectacular moon images. Tonight is a full moon. Go give it a try! if you can’t tell from the name of my blog, I am enthralled by all things space. I am amazed at the precision with which humans can launch a rocket from Earth and land Man or machine on distant moons or planets. I am humbled by the dedication each astronaut has for their “profession” and proud to know that I have shaken hands with Jim Lovell, Fred Haise, Charlie Duke, Gene Cernan, and countless other moonwalkers, astronauts, and mission control personnel. When I heard of Neil Armstrong’s passing, I was saddended that I never had the chance to meet him. From everything I had heard about him, he was humble, and convinced that he was just doing his job when he took Man’s first steps on the moon. 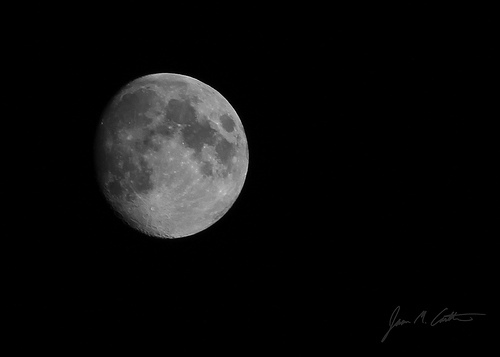 So this post is my way of honoring Neil Armstrong, and I invite others to share their moon photos this week in his honor. I digress. This blog post isn’t just about my love of space. It’s about my experiences in photographing the moon, and sharing with others the simple things that will hopefully give them the confidence to DIY and shoot [for] the stars… or at least the moon! Here are the 4 simple steps I used a few moments ago to capture this shot of the moon, with a clarity that even surprised me – though I wish I had a more powerful zoom lens. Or better yet, a Saturn V rocket to take me to the moon to snap a few photos in person! And a setting that hopefully will make you LOL: Focal Length 238,900 Miles. Choose a location that works for you. The photo above was shot from my back door. If you can, get away from ambient light. Find the moon (if it’s overcast, go back inside and try for the moon another night). Zoom your lens all the way in to get as close to the moon as you can. You can auto focus on the moon, then switch to manual mode (which is what I did), or you can just refocus on the moon for each shot (which also works). Hold it steady and snap a shot. You can simply look at the LCD screen on your camera to get an initial look at the photo (unless you are using film). If the moon looks dark, adjust one of two things – the aperture or shutter speed. If you’re not using a tripod and the moon looks blurry, try again. You can try holding your breathe as you pust the shutter release button to reduce your movements. Keep adjusting camera settings to snap a few shots. No harm in trying a few different settings to see how it changes the outcome. Now that you have the photos, take the camera card over to your computer and adjust the exposure, temperature, etc. as you wish. You can even make it a black and white photograph to eliminate any odd colors of the moon (unless you want it to be a rare Blue Moon). I hope this helps, and I invite you to give it a shot (literally) and then share your photo and camera settings with me in the comments. With the Blue Moon on Friday (Aug 31), it’s a great week to give the moon a shot… literally! Good article but you forgot the most important detail for a lunar photography beginner, exactly how ambient light affects the shot. I tried taking a shot outside my house since you used your back porch. But I didn’t realize how big a factor surrounding light would be, had the moon centered the exposure settings inputted, and I got nothing but a black sky because the light around me was too strong. So good tip if ambient light is too strong you’ll need a MUCH longer exposure I had to shoot at 13/1 because I was by a light post. I’m only posting this here because I read nearly 15 articles on the subject and not a one had this detail. So please make a edit or updated version.